The time has come and the Atlanta Women’s Build is upon us. The families are excited and so are we. Thank you to all those who have already registered. If you would like to join me on my date it is Saturday, Sept 29th. If you can volunteer another day instead that would be great also. Please find below basic info regarding the Atlanta Women’s Build. I hope that you and friends from your network can attend and help us build these two homes for Ms. Worthey and Ms. Evans! Note that every volunteer contributes a min. of $100 to hold their volunteer slot, which in turn helps us recover the cost of land, professional labor and construction materials. Thanks and please let me know if you have any further questions. In its 15th year, the AWB is our build in which we construct two homes for two women homebuyers with women only – women volunteers, women Construction staff, women Skilled Supervisors, etc. The dates for this year’s AWB are Sep. 22- Nov. 10 (all consecutive Saturdays). Atlanta Habitat is one of the largest of 1,500 U.S. affiliates of Habitat for Humanity International, and the largest nonprofit homebuilder in Atlanta and Fulton County. Atlanta Habitat transforms neighborhoods by bringing generous donors and hardworking volunteers together with working families to build high quality, green homes. 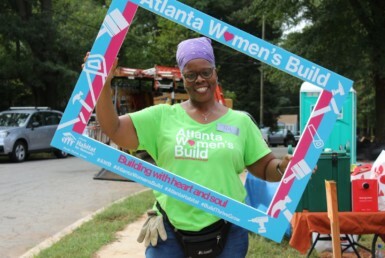 The Atlanta Habitat’s Women’s Build (AWB) is a grassroots effort led by individual women who raise funds to sponsor and construct an Atlanta Habitat for Humanity home for a working mother and her family; this year we will build two homes for two families. Over eight weeks, women volunteers work side-by-side with the homebuyer to construct the house, offering a unique opportunity to highlight the ways that Atlanta Habitat empowers women and builds stability in communities. The Atlanta Women’s Build has been a powerful catalyst since 2003 and has built 11 homes for women, by women. The AWB website is http://www.atlantahabitat.org/awb/ to sign up. Ms. Worthey is a registered medical assistant, working at an elementary school. She is active in her church, and she enjoys helping others. Her hobbies include reading, playing pool, and doing anything with Masih. Ms. Worthey’s mother has a Habitat house on Wiley Street, and Ms. Worthey grew up in that house. She is now ready to leave apartment life behind so that she raise her son in a home. Ms. Worthey really wants a large yard so that Masih can freely run and play outside. She and her entire family are excited about Ms. Worthey taking this step towards homeownership, just like her mother did. Ms. Evans works at a supply company pulling orders. She enjoys skating, movies, and bowling. She has two children and two grandchildren. She also is very close to her nieces and other extended family members. She spends a lot of time with family members. She grew up in a home and really wants her own home because she wants the equity and she wants to spend time taking care of it. She is very excited about building her new home in Hammond Park.